An apple a day keeps the doctor away! This brekkie is Yummi-Licious and Super Healthy! Full of vitamins, minerals and fiber, low calorie and TONS OF ENERGY! 5-6 tablespoon virgin coconut oil. Crack egg into mixing bowl and whip the egg. Add cinnamon and Micro Sliced Chia. Add oil into frying pan at medium low heat. Dip bread into mixture until both sides are soaked wet. Cook each side 1-2 minutes until desired finish and remove from pan. Add oil into same pan on medium low. Add apple into frying pan and cover. Stir every 1-2 minutes until soft. 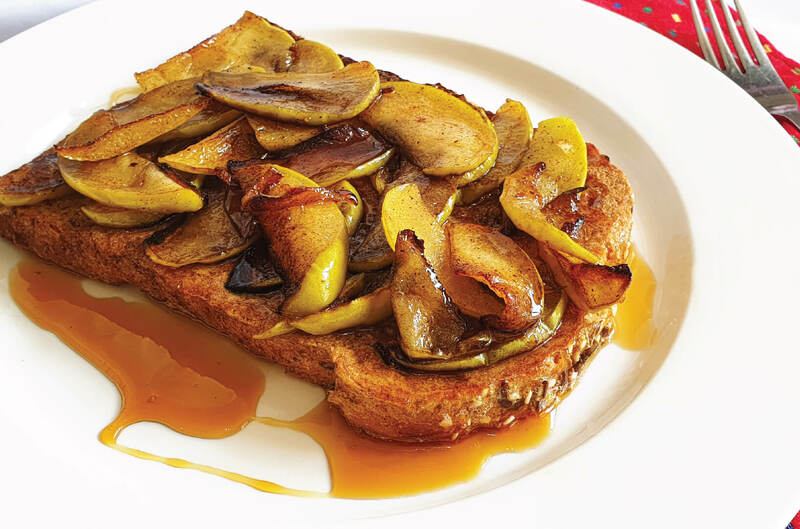 Place apple slices onto French toast.